One of our favorite ways to incorporate healthy foods into our diet is to use fresh produce that is in season. This yummy salad includes figs that are delicious, in season and packed with nutrients. This salad also doubles as a great leftover meal to bring to work. 8 ounces of chicken breast, cut into thin slices. Peel, seed and chop the butternut squash into ¼-inch cubes. Spread evenly on a baking sheet and drizzle with 1 tablespoon of olive oil, salt and pepper. Place in the oven, tossing occasionally, until golden brown, about 20 minutes. While butternut squash is in the oven, heat ½ tablespoon of olive oil in a medium-sized skillet over medium heat. Add onion to the skillet and stir occasionally. When they begin to soften and turn brown, add salt and pepper. Continue to cook on low heat until you are ready to serve. Add olive oil to a separate medium skillet. Over medium heat, brown the sliced chicken, spreading out evenly over the pan, season with salt and pepper. Ensure that the chicken has reached 165 degrees cook over low heat until ready to serve. Cover the bottom of a small skillet with about an ⅛ inch of water and a sprinkle of salt. Slice the figs in half and place them in the pan over medium heat for a few minutes. When they begin to brown flip them over and continue to cook on low heat. For the salad dressing, add all ingredients for the dressing into a food processor or blender. Blend until all ingredients are incorporated. Arrange a handful of greens on the plate and dress with about 2 teaspoons of dressing. Toss the greens to coat evenly. 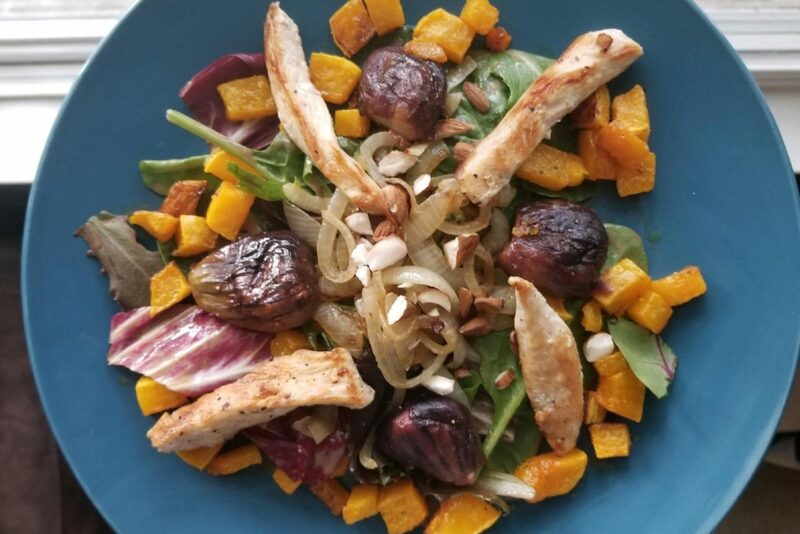 Arrange the butternut squash, onions, chicken, figs, and almonds over the greens. If desired drizzle over an additional teaspoon of dressing. Enjoy!